Immigration minister Caroline Nokes is to visit Dover amid growing criticism of the government’s handling of the surge in migrants crossing the Channel. More than 220 people have tried the crossing in small boats since the start of November and Home Secretary Sajid Javid has declared a “major incident”. Dover MP Charlie Elphicke has called for more patrol boats in the Channel. He said the Home Office “has not been taking this seriously enough and the crisis has continued to escalate”. It comes after another 12 people were detained off the coast of Dover in the early hours of Friday morning. Mr Javid has been appointed “gold commander” to take control of the response and will now receive daily updates from the Home Office. He will talk to his French counterpart about the situation over the weekend. Mr Javid has also asked the Border Force to consider whether employing more vessels would act as a deterrent or encourage more people to make the crossing. 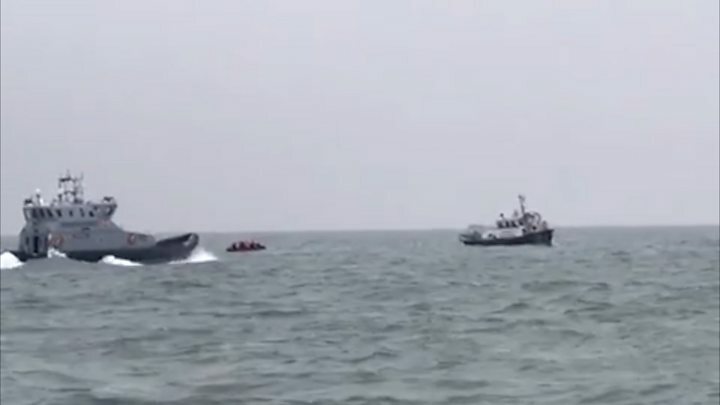 Only one of the Border Force’s fleet of five cutters – specialist boats which the force describes as being capable of rescuing several migrant boats at the same time – is currently operational in the Dover Strait. Ms Nokes and Mr Elphicke are to discuss the situation with Border Force officers in Dover. Mr Elphicke said “we need a clear strategy to defeat the traffickers”, adding that the French authorities should step up action on their side of the Channel. British fisherman Matt Coaker first saw an overloaded three-man dinghy in September, carrying four adults trying to make it to UK shores. “They started waving their oars and tying T-shirts on the oars to get our attention,” he told BBC Radio 4’s Today programme. He said the dinghy had a lot of water inside and that the migrants “just looked like they had had enough”, adding: “They had been drifting about for some time, they had no engine and just a few oars. The fisherman pulled his boat alongside them to check how they were, and one of the men made a jump for it. “Luckily the customers I had on-board managed to grab him before he went back in the water, because the last thing you want is someone going down underneath the propeller,” said Mr Coaker. He has seen a number of dinghies since, including one at night carrying two families with an 18-month-old girl in tow. And while he said it wasn’t the norm, it now “doesn’t surprise you if you go out and see a rescue taking place”. Officials on both sides of the Channel have warned of the dangers of crossing what is the world’s busiest shipping lane in a small boat. Police have likened the journey to trying to “cross the M25 at rush-hour on foot”. Many of the migrants are Iranian or Syrian. A BBC South East investigation last month found that people smugglers were telling migrants they must enter before “the borders shut properly” after Brexit. British and French authorities have both said the rise in crossings is the result of “organised criminality” and “mafia networks”. Responding to the suggestion that bringing rescued migrants to the UK could encourage people to attempt the journey, Steve Valdez-Symonds, from Amnesty International, said that was “nonsense”. “If people are in danger of their lives then they need to be saved,” he told the BBC.